On the ninth of this month [December], the Conception of Saint Anna, Mother of our Most Holy Theotokos. 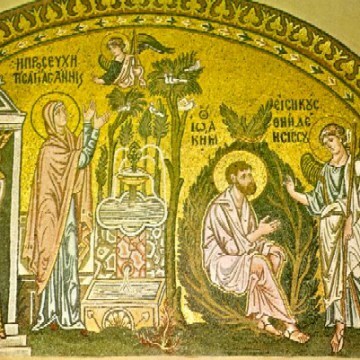 Our Lord and God, wanting to prepare for Himself a living temple, and holy house to dwell in, sent His Angel (who it is said was Gabriel) to the righteous Joachim and Anna. From them He was pleased to have born His Mother according to the flesh. And having sent him he proclaimed that the barren and elder Anna would conceive. This conception of the barren woman was done in order to confirm the special and seedless conception and uncorrupt birth of the Virgin. 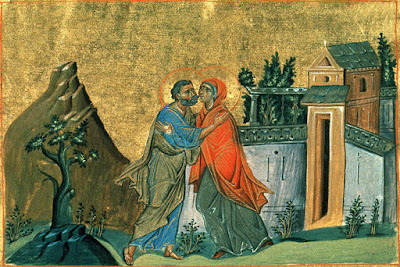 Therefore the Holy Theotokos and Virgin Mary was conceived in the womb of Anna by the seed of Joachim. She was not born, as some say, after seven months or without a husband, rather, after nine full months and in union with a husband. Except, however, it was foretold to her by the proclamation of the Angel and beyond the laws of nature, in that Anna was barren, and she was an old woman. Only our Lord Jesus Christ was conceived and born without the union of a husband and without seed, by the Holy Virgin Mary in an amazing and unexplained way which He alone knows. And because He was perfect God, for this reason His entire economy in the flesh was perfect. Even human nature in the beginning He created and fashioned perfect. Such a day we celebrate today. Because we remember the divine oracle and joyful message given by the Angel to the righteous Grandparents of God, regarding the conception of the pure Mother of God. To them was fulfilled all that was spoken in the oracles of the Angel, by Him Who brings all things into being from nothing, allowing the barren and old womb of Anna to bear fruit. She who passed her life without a child, in a strange manner became a child-bearing mother today. And He grants to the righteous ones worthy fruit by their entreaties. He was pleased to have born to these chaste parents a daughter who before the ages was predestined and chosen from all generations, from whom He was destined to be born. Their Synaxis is celebrated in the revered house of the Theotokos, which is within Euoranois near the most holy and great Church. 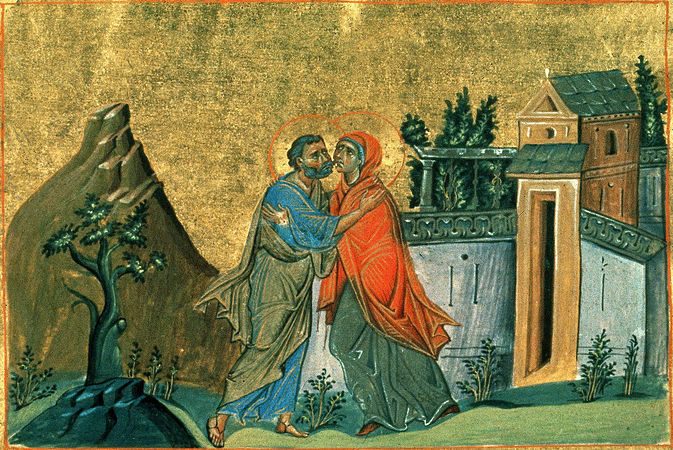 Today the bonds of barrenness are loosed; for God listened to Joachim and Anna. He promised them - although it was beyond hope - that they should bear a divine child. From this child was born incarnate the Infinite God, Who told the Angel to cry to her: Rejoice, full of grace, the Lord is with thee. Today the world rejoices in the conception of Anna, wrought by God. For she bore the One who beyond comprehension conceived the Word of God. “You are He Who once gave the great Isaac as a son to Sarah in deep old age by Your overshadowing and your promise. You, O Almighty, are He Who opened the barren womb of Hannah, the mother of Samuel Your Prophet. And now You look upon me, and accept my supplications, and fulfill my entreaties,” cried the chaste and barren Anna with lamentation; and the Benefactor heard her plea. Wherefore, with joy she conceived the Virgin who beyond comprehension conceived the Word of God.